From William Van Alen's Perspective. As we stepped into the 1920's, otherwise known as the "Roaring Twenties", many Western and European societies were experiencing massive economic prosperity. This wealth was surrounded by excitement and optimism due to the end of the First World War. These post-war conditions gave birth to the Art Deco movement. The term "Art Deco" was coined in Paris; the year was 1925 and the city was hosting the International Exposition of Industrial and Modern Decorative Arts*. Today, the Art Deco movement is remembered mainly for its Art, Fashion Design, Architecture and furniture. In addition, it should be mentioned that when studying this movement, it was apparent that Art Deco was influenced by mostly by Futurism and a bit of Art Nouveau. This movement has managed to leave a lasting impression in the World's largest cities, when it comes to architecture. It was this movement that paved the way for our modern day skyscrapers. That being said, the city of New York was a ball of energy at the turn of the century and gave birth to a great architect by the name of William van Alen. This man would grow up to create some of the most iconic structures in New York. Still standing today, van Alen’s buildings are the physical representation of the Art Deco period. In 1928, the city of New York was about to erect one of the last Art Deco structures, The Chrysler Building. The building was a project funded by Walter P. Chrysler, the American automobile mogul. It would be known as the tallest structure in the world, until 1931, when the Empire State Building would take its place. Upon its completion, the structure composed of steel, concrete, glass and ornate gargoyles shot out of the ground at 318 meters. This architectural wonder’s movement can be found in the details. Especially, when looking at gargoyles that surround the building. They were fashioned with futuristic characteristics to resemble car ornaments. Also, the Chrysler Building was designed in a very cohesive manner. Every aspect of it is smooth and perfectly crafted, which give all who visit this tower the impression of observing one sleek and homogeneous work of art. Moreover, this structure was built with the strong lines associated with Art Deco in mind. As a matter of fact, the details on the spire, such as the windows were designed in the shape of sharp triangles. Further, the windows are complimented nicely by the strong curves of the spire. Furthermore, when observing this building at a great distance, one can see during the day, the way the grey structure contrasts against the blue sky. Not to mention, the way the brightly light building cuts through the night sky. It is without doubt that when William van Alen built this skyscraper his main goal was to have all those who viewed it to be in awe. As their eyes work their way to the tip of the spire their mind is taking in all the beauty. The Chrysler building can be seen as representing many different qualities, because the 20’s were such a wild and innovative time. However, one unquestionable quality of this building is strength. 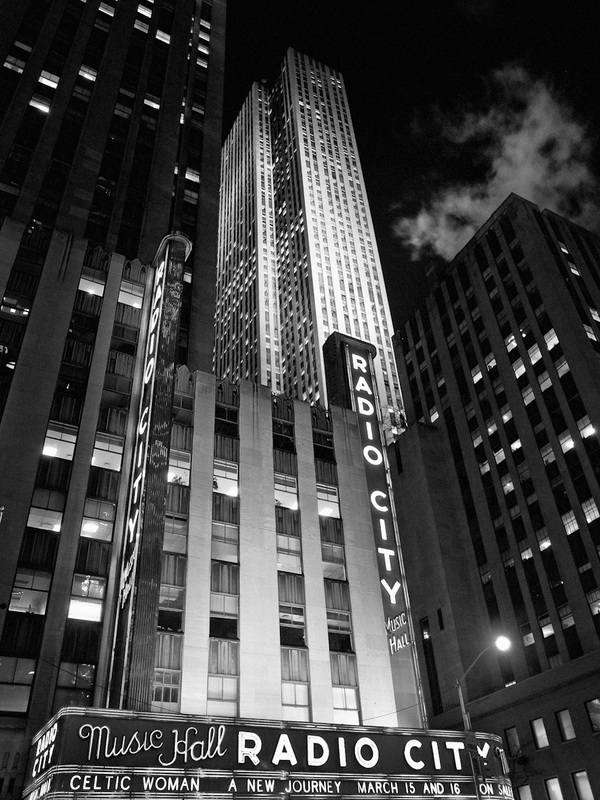 Upon completion of the Radio City Music Hall, in 1932 by architect Edward Durell Stone. The city of New York was put on the global map as a must see city. This music hall was referred to as the Showplace of The Nation for decades. The exterior of this Art Deco building was crafted using brand new industrial material, like steel, glass and a lot of lights. Moreover, there is nothing in this structure that indicates movement. The design is very straight forward. 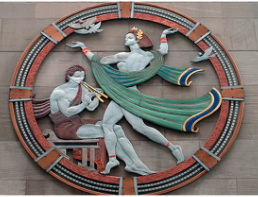 However, the unique details of the music hall, such as the three circular panels, referred to as Art Deco rondels do have movement. These panels are individual artworks that have figures and a subject matter. 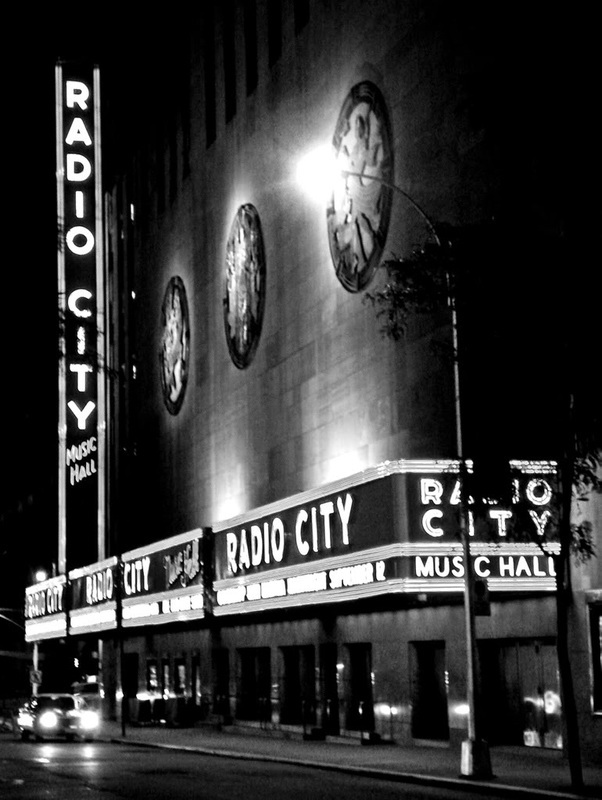 Further, the very first time we set our eyes on the Radio City Music Hall our eyes are drawn toward the bold and well-defined lines of the signage. Also, we notice the sign first, because it is protruding out of the building and is brightly illuminated. 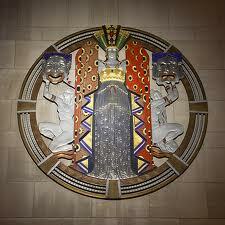 A characteristic of Art Deco is the use of bold colour. This characteristic was utilized when the sing was made. The colours used, the red and blue, are quire representative of the lively and vibrant time period. In Closing, the Roaring Twenties are long behind us, but the heart and soul of the movement is still apparent all around us. Today, the flapper dresses maybe out of style, however, the strong lines and bold colours are reappearing on runways worldwide. Finally, the buildings constructed in cities all over the world, over the course of the 1920's and 1930's, stand tall and proud to this day as a piece of living history that we are lucky enough to admire.